In a football sense, what constitutes a miracle? Leicester City winning the Premier League possibly? Maybe Nottingham Forest winning the Football League and two European Cup’s in consecutive seasons? Or, perhaps it’s the rise of Wimbledon from non-league to winning the FA Cup, and on the same vein, Wigan Athletic doing exactly the same, albeit over a much longer time span? In literary terms, one of the great stories was charted in the book ‘The Miracle of Castel di Sangro’ whereby writer Joe McGinnis spent a season following the minnows of Italian football who confounded the odds and made it to Serie B. I guess as well, you could have an argument for TSG Hoffenheim in Germany who have made it to the Champions League, after being nothing more than a village club playing in the fifth tier. However, the Hoffenheim story owes an awful lot to one man’s money. For me, one of the greatest modern day miracles happened in May 2016 when Burton Albion were promoted to the Championship, the second tier of English football. But to really understand the magnitude of the achievement, it is worth examining the timeline of a club and charting where they came from. When I first watched the Brewers in the late Seventies, they had just moved from the First Division North of the Southern League, into the Northern Premier League. At that time, that would have been the second tier of non-league football, so in simple terms, it was the sixth level nationally. Crowds were decent at the old Eton Park, typically in the high hundreds, and for a bigger game, four figures was commonplace. Neil Warnock was manager of the Brewers at the time, and one game that stands out for me was an FA Cup First Round tie against Windsor & Eton that they lost 2-1. The atmosphere that day was incredible. Burton were a renowned cup side as well, with a game against Leicester City in the 3rd Round of the FA Cup hitting the headlines for all the wrong reasons due to crowd trouble at the Baseball Ground. A move back to the Southern League came in 1987, and to be fair, in the fourteen seasons they spent in that competition, two second placed finishes came in the final two seasons, but that was as good as it got for a club that flattered to deceive. By now, Nigel Clough had arrived, and a decision was made to move back to the Northern Premier League for the start of the 2001-02 season. They won the league at a canter, losing just two games, amassing 104 points and scoring 106 goals. Promotion to the Conference had been achieved, a status that had been many years in the waiting for a club that many considered to be a sleeping giant. 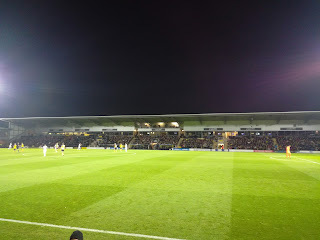 It was in the early seasons of the Conference that the club moved to the impressive Pirelli Stadium which was effectively just over the road from the old Eton Park. 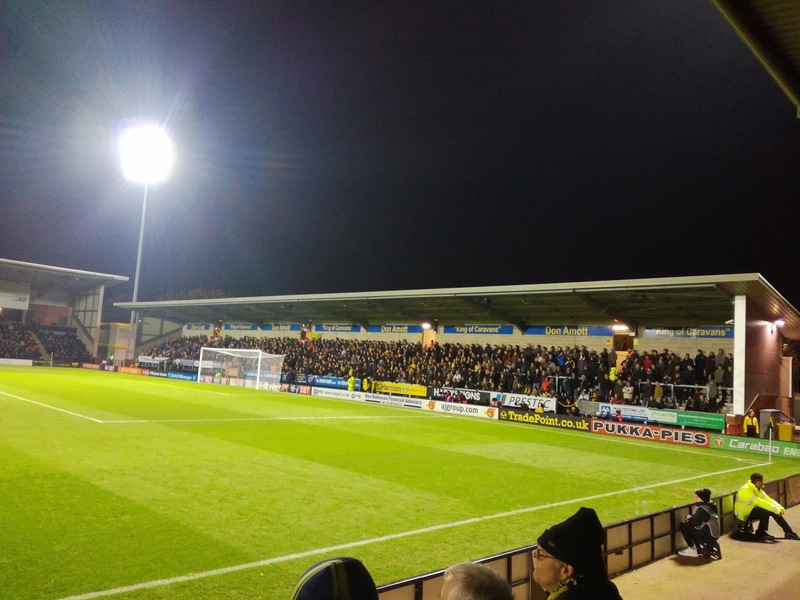 Combined with that, it was in January 2006 when an event happened which unquestionably shaped what was to be the immediate future of Burton Albion Football Club. A run to the Third Round of the FA Cup saw Albion draw the might of Manchester United at home. In front of the TV cameras they performed a minor miracle in holding the Red Devils to a 0-0 draw, thus earning a money spinning replay at Old Trafford. Albion lost the replay 5-0 in front of a full house, but it mattered not, financially the goalposts had moved hugely. The club missed out in the Conference Play Off’s in 2008, but the 2008-09 season was to be a record breaking one. Under Clough’s leadership the Brewers stormed to a huge lead at the top of the table, to the point where some bookmakers paid out with months of the season still to go. Clough left the club and was appointed into the hot seat at Derby County, Roy McFarland was given the task of steering the ship home. He very nearly sank the ship! 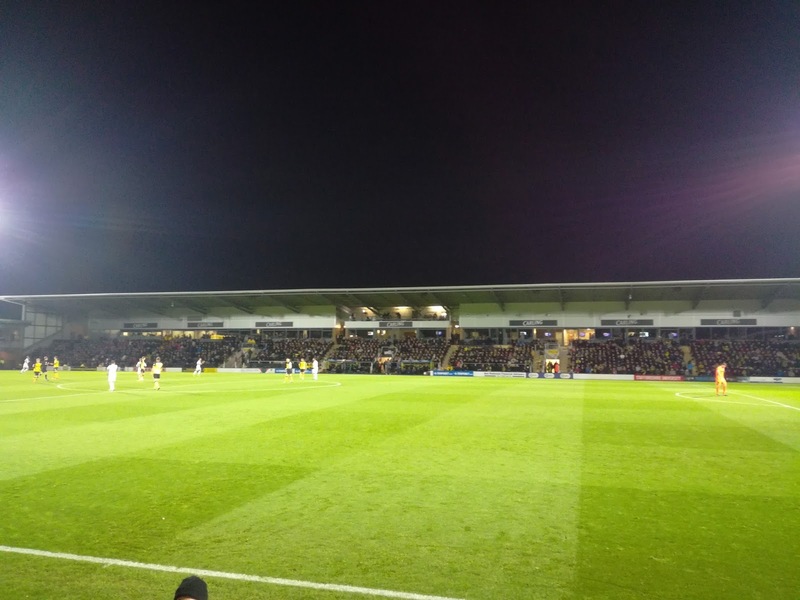 I was at a rammed Pirelli Stadium for the last home against Oxford United where the title could have been sealed, a 1-0 defeat put paid to that, so it went down to the final game at Torquay, results went in the Brewers favour and the nailbiting end to the season was over. Burton Albion were a Football League club. The club spent six seasons in League Two, twice missing out in Play Off’s, and we were at the Final in 2014 when they narrowly lost 1-0 to Fleetwood Town at Wembley. The Championship finally came at something of a canter in 2014-15, and League One beckoned. All expectations were exceeded in that inaugural League One season, Manager Jimmy Floyd Hasselbaink took them to the summit and a returning Clough pushed them over the promotion line on the last day of the season at Doncaster Rovers. It was now the Championship, games against Derby County, Nottingham Forest, Aston Villa, Wolves and Leeds United. This was going to be very different to the Southern League Division One North and away days at the likes of Barry Town and Wellingborough Town. The club survived their first season in the Championship, finishing twentieth out of twenty four clubs. Both Derby and Forest were beaten at the Pirelli, while I was present on the night the Brewers came away from Pride Park with a point. It was an unthinkable result on an unthinkable occasion, and it was that night that really made me realise just how far this club has come. Oh what it must have been like to have started supporting the Brewers in the Seventies and to be now watching this? This season has been tough as expected, and with Sheffield United due in town needing a win to return to the top of the league, it was time to witness a Championship game at the Pirelli for the first time. What I like about a trip to the Pirelli is that the feel of the club is no different now than it was when they were a non-league club. Parking is easy, the local pubs friendly, getting tickets is not a problem as crowds of around 5,000 are well within the capacity of the stadium. The food and drink in the ground is good, the welcome is very hospitable and the fans, while passionate, are no bother at all. 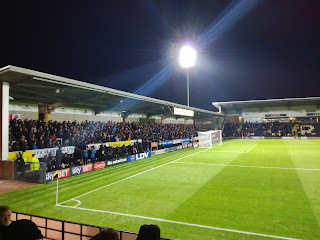 I said to my mate Mark (a United fan who couldn’t get a ticket for the away end), that it still felt like I was going to a game in the Conference when I sat in the bar, and I don’t for one minute ever expect that feeling to go away, and I suspect it’s the same for many Brewers fans. United took the lead through a dodgy Billy Sharp penalty, but Matty Palmer scored a cracking equaliser from distance. Sharp beat the defence to make it 2-1, but then disaster struck when highly influential Blades midfielder Paul Coutts was stretchered off with a broken leg. 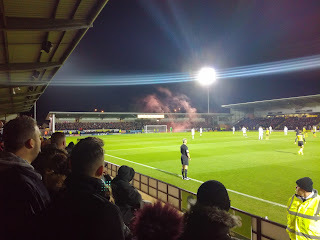 This seemed to knock United who weren’t as effective in large periods of the second half, but a third goal did eventually come via Leon Clarke who bundled the ball home. United were worthy winners, and played with a certain confidence and swagger in the first period. Albion’s problem is scoring goals, they are a tight and well organised outfit but create few chances. Could their time in the Championship be up this season? I suspect it will be, but I’m pretty sure few tears will be shed, because for most Albion fans, to have had two seasons playing at this level of football, would have been simply unthinkable all of the years ago, and even up until recently. It is a modern day miracle, brought about by hard work, good judgment, sensible decisions and absolutely World class leadership by Chairman Ben Robinson. Forget Leicester, Forest, Wimbledon and the likes, this achievement is as good, if not better than any seen before in modern day football. Maybe when normality sets in (whatever that may look like), only then will the footballing World begin to understand the magnitude of what they have been witnessing.